Bluewater is pleased to say they often come in as the lowest priced training provider, especially for the Master and OOW courses, not only that but their instructors boast incredible pass rates, some of the best in Europe! They only work with the very best instructors to train crew, to prepare you for your career at sea. Their backgrounds include the Royal Navy, the Merchant Navy, the US Army, RYA Assessors, University Professors and more. 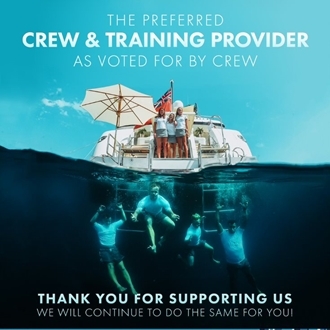 For the yachts who need to hire more than 1 crew member in a 12 month period, and have crew to be trained, this exclusive recruitment and training bundle is the perfect solution. Call in to their offices in Palma, Antibes or Fort Lauderdale for more details of the ONE Account. Whatever the cost of your ONE Account, you will be refunded every penny back in training vouchers to be redeemed at any of the Bluewater global training academies. What’s more, your yacht will have access to the recruitment database of 120,000 qualified and experienced crew. When you register for free with Bluewater, the ONE Account captains are searching your profiles and can contact you directly regarding career opportunities. If you are looking confidentially, your profile is hidden and the experienced recruitment agents take personal care of your job placements. Take a look at the live job board, and see what opportunities there are for you. Register your CV with the number 1 recruitment agency in the world, and watch your career go from strength to strength.